This page describes the Applied Physics and Superconducting Technology Division contribution to LCLS-II. The main LCLS-II page can be found here. LCLS-II will be the upgrade of the Linac Coherent Light Source (LCLS) that is in operation at the SLAC National Accelerator Laboratory since 2009. 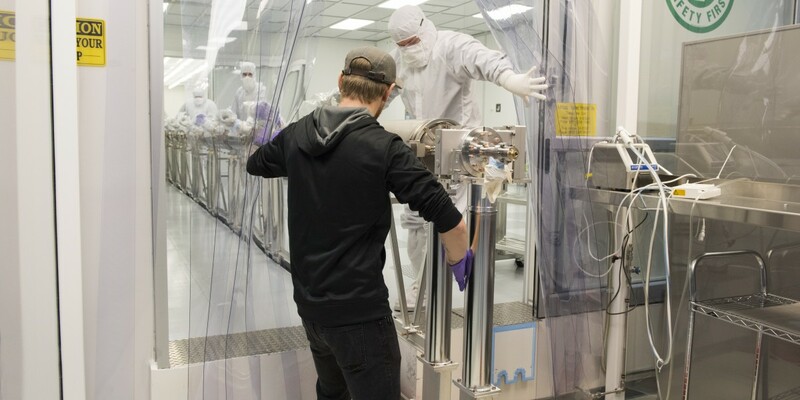 Like its predecessor, LCLS-II will provide ultra-bright X-ray pulses that allow the study of the structure of molecular structures, chemical reactions, matter under extreme conditions and many more. It will extend the capabilities by providing higher maximum photon energies up to 25 keV, tunable photon energies via variable undulators in the range of 0.25 keV and 5 keV and increasing the repetition rate from 120 pulses per second to 1 million pulses per second. 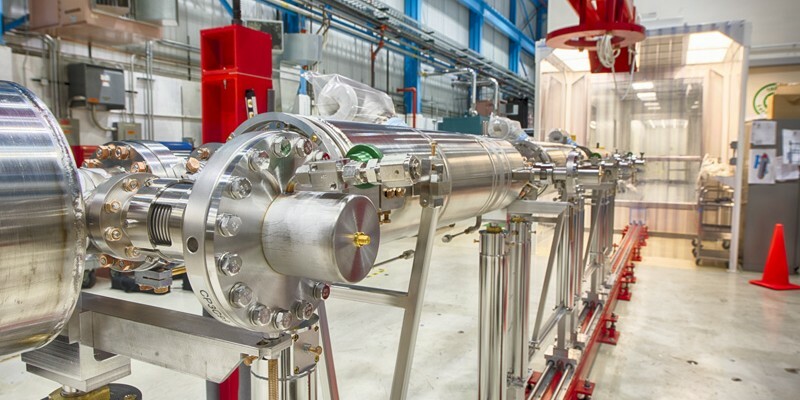 Centerpiece to the upgrade is the addition of a new 4 GeV linac based on superconducting radio frequency (SRF) technology. Only the transition from normal conducting accelerating structures to SRF cavities allows the enormous increase in repetition rate. The operation of the SRF cavities in continuous wave mode (cw) with optimized operational costs is possible with the application of the nitrogen doping technique that was pioneered in the Fermilab High Q0 R&D program. The technique provides unprecedented high quality factors and respectively very low losses. It has been transferred to the cavity manufacturers and will be applied in a full accelerator at LCLS-II for the first time. 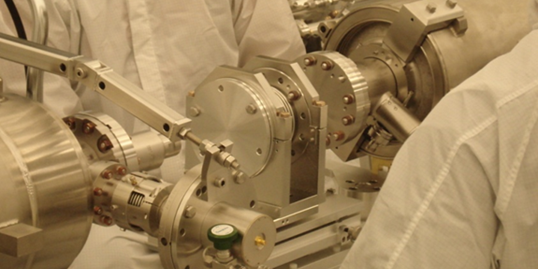 The nitrogen doping process, invented at Fermilab, substantially raises cavity quality factors, in effect lowering both the cost of cryogenic infrastructure and operating costs. 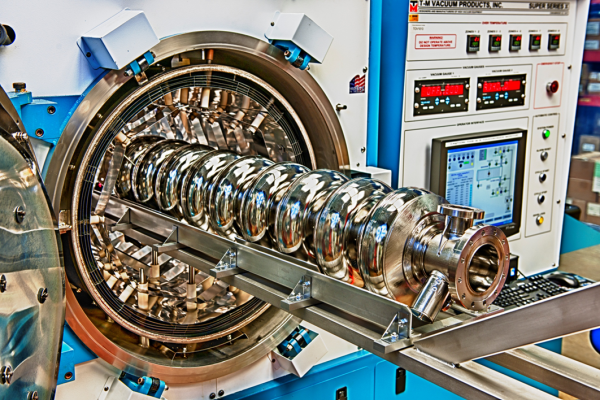 LCLS-II cavities are processed in ultra-high-vacuum vacuum furnaces at 800 C to degas hydrogen, followed by injection of low-pressure nitrogen, which enters the material and dopes it. Fermilab Applied Physics and Superconducting Technology Division is working on the design of the cryomodules that house a string of eight SRF cavities each, together with magnetic shielding, thermal insulation, cryogenic piping and the mechanic support structure. 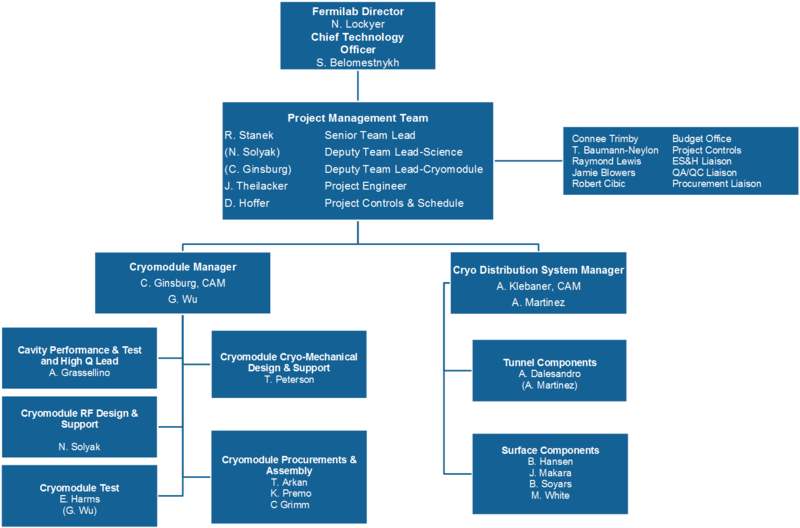 The assembly of the cryomodules will be split between Fermilab and Jefferson Lab. Once the cavities arrive at Fermilab from the manufacturers, they will be tested in a vertical dewar, submerged in liquid helium, at 2K, in order to make sure that they meet the desired performance goals for the accelerator. If that is the case, they proceed to the string assembly in MP9, where eight cavities are connected to the string that will be at the heart of every module. 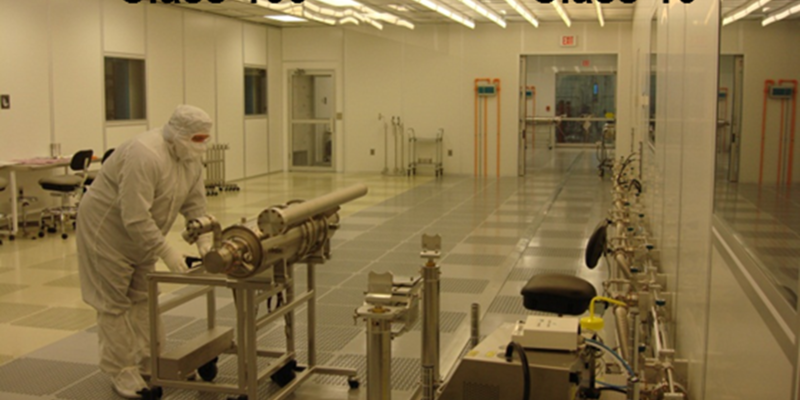 The connections have to be done in a clean room under very controlled conditions, so that the inner surface is not contaminated and the cavities retain their performance. 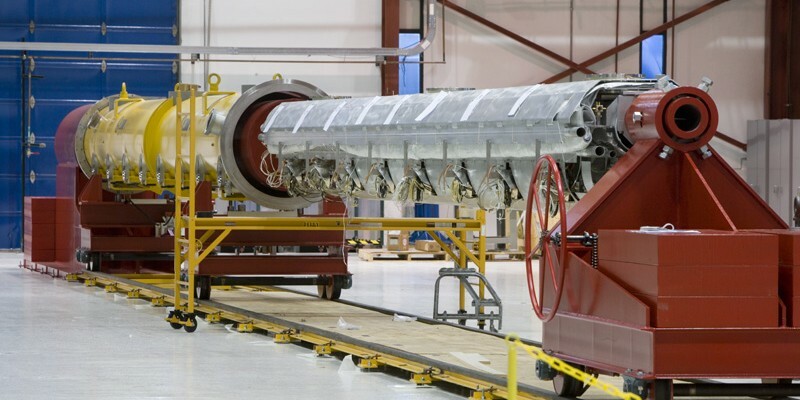 After rolling out the string from the clean room and combining it with the mechanic support structure and cryogenic piping and adding all magnetic and thermal shields, it is inserted into its vacuum vessel and the complete module is tested at the Cryomodule Test Stand (CMTS), to check the cavities performance once more before shipping the modules to be added to the accelerator at SLAC. In addition to the 1.3 GHz cryomodules Fermilab is responsible for the design, assembly and testing of the two cryomodules with 3.9 GHz cavities. Clean assembly requires highly skilled workers, state-of-the-art facilities, and careful procedures. LCLS-II cavity string after removal from MP9 cleanroom. Coldmass insertion to a vacuum vessel in ICB. 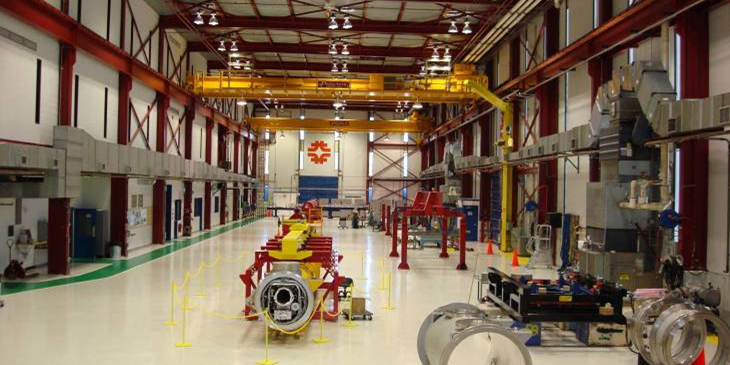 Cryomodule assembly floor of ICB. 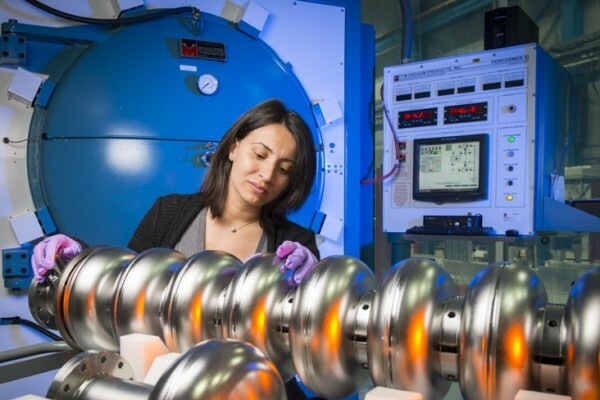 Applied Physics and Superconducting Technology Division’s responsibilities for LCLS II include also the design and fabrication of the superconducting magnet packages that are installed inside cryomodules to focus and steer electron or proton beams. The magnet package consists of one quadrupole and two dipole windings. It is splittable in the vertical plane configuration and has features for conduction cooling. Prototype magnets were successfully tested at room temperature, in a liquid He bath, and in a conduction cooling experiment. Serial production of 35 magnets for SLAC LCLS-II linear accelerator has started at the Applied Physics and Superconducting Technology Division. Magnet test in the conduction cooling mode. Assembled magnet (left) and the magnet yoke (right). Magnet set up for the conduction cooling test. The magnet view inside SCRF Cryomodule.